I typically encounter few problems when cooking or baking things that I eventually post on Use Real Butter. There may be some recipes that I merely feel “meh” about and hold off posting those for times when I’m out of posting material. And then there are times, like this past week, when I try a recipe and it didn’t come out as I had hoped. This actually happened with TWO such recipes and the end results are kind of important to me (okay, okay, I AM OCD). I even told Tartelette I wasn’t sure I wanted to bother redoing them this weekend. But redo them I did… and with the proper results. That makes me feel better. Most of today was spent working on a rather odd project that I’m pretty sure not a one of you has ever embarked on making before. More on that tomorrow. I’m quite jazzed about it. The other day I had a few Granny Smith apples lying about with no designated purpose. I didn’t think too much about them until I was working out and the thought of caramelized apples bounced into my head. I tossed about the idea of a deconstructed apple crisp, but I’m not as keen on deconstruction as say… reconstruction. If you will recall the apple cranberry crisp from not to long ago, I went for the same theme, but different presentation. I sliced up the apples and browned them in sugar and butter until caramelized and gooey. Smelled heavenly. They cook down to a pretty small yield, so I suggest one apple per 4-inch tartlet shell. The shells came out rather crunchy. Even though I love crunchy, these were too hard to break through easily with a fork. Perhaps I should have made them much thinner, or cooked them for less time. I think the next time, I will use a short dough with some oatmeal mixed in for the shells. I had some homemade vanilla ice cream and cranberry sorbet in my freezer. Adding a few scoops to the tartlet, I was able to recreate the flavors from the crisp, but in different form. Cut the sugars into the softened butter. Mix in the flour and oats until coarse crumbs are formed. Press the dough into 4-inch tartlet pans (I got 4, but maybe I should have made them thinner and gotten 6). Bake at 350°F for about 10 minutes or until just golden. Remove from pans and let cool on cooling rack. Melt the butter in a saucepan. Toss the apples with the sugar and then add to the saucepan. Add the cinnamon. 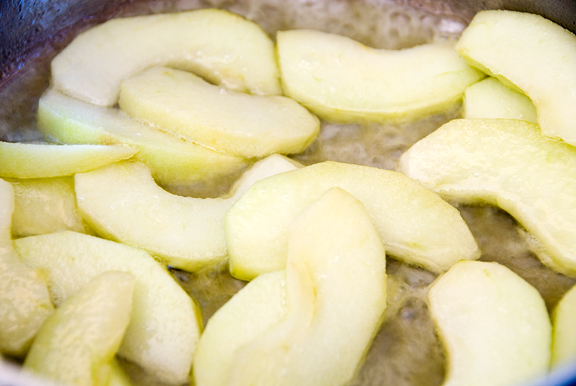 Cook the apples over high heat, stirring the apples until they brown and the sugar and butter turn to a thick caramel. Remove from heat. 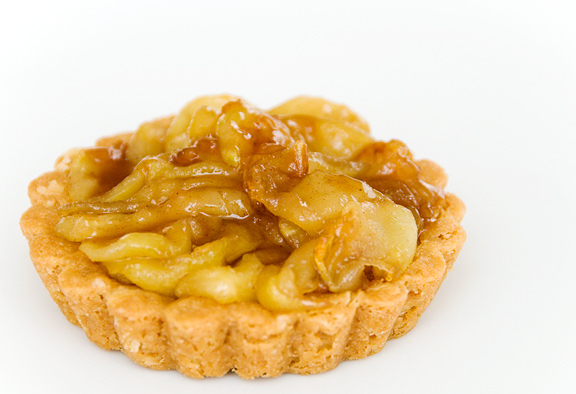 Fill the tartlet shells with caramelized apples. Top with a scoop of vanilla ice cream and a scoop of cranberry sorbet. I might just do something like this. I make quince sorbet today after seeing your cranberry and that would be nice with the apples. I understand the whole OCD schtick…my children I’m sure will need serious counseling b/c of my infatuation with orderliness…..no toys downstairs, no toys strewn all over the playroom when you’re not playing with them, no toys not put away in their proper place, you get the picture….basically I’m Joan Crawford in the 00’s but a little less “NO MORE WIRE HANGERS!”…HEE-HEE! The dessert looks fab even if crunchy….I bought some of those little tart tins and I’ll have to give this a whirl….thanks again! These are very interesting, Jen – I have had apple pie several times, but never with a caramelized topping. This inspires me. As Thanksgiving approaches I’m trying to determine what I’ll do to make the dessert tray a bit different from years past. 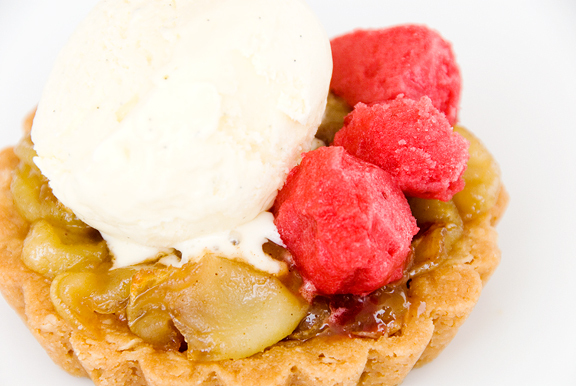 Tarts, tartlettes are a perfect excuse. I don’t have little tart pans, but I do have the mini-muffin tins and now I have some ideas. Thanks! This happens to me all the time…the recipe doesn’t turn out the way I planned and then I’m like CRAP! I have nothing to post about! 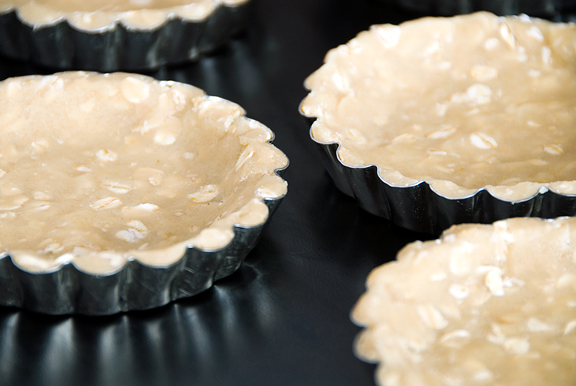 I see however you’ve made a flawless recovery – beautiful tarts! Great that the this attempt yielded a proper result! I like it with the ice-cream and sorbet!! So cool! Even thought the crust didn’t turn out good but the presentation definitely made up for it! That is an apple dessert I could definitely eat. It looks wonderful and that sorbet still looks amazing! you’re creativity juices are flowing out of the dam, eh??? love the whole concept of this one! Mark – that sounds pretty good. I’m too impatient to futz around with crusts. I am all about the fillings! Patricia – the caramelized part is soooo nice! Anita – oh, I’m sure you can salvage something better than I ever can. I think your recipes are awesome! Holly – I just love the red color of the sorbet, and it’s natural!